In 2007, CNN.com and Forbes.com ranked Physician Assistants as the fourth-fastest growing profession in the country. The United States Bureau of Labor Statistics projects that PA jobs will increase by 27 percent by 2016. These aspiring health-care professionals must pass the Physicians Assitant Certification Exam. This book offers test-taking strategies, steps to becoming a certified PA, and two full-length exams with detailed answer explanations. 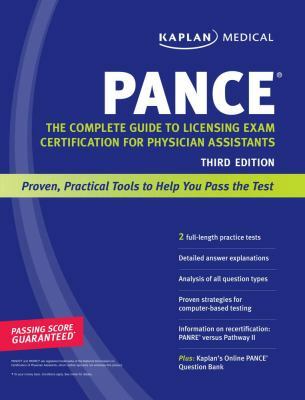 It features: An overview of the PANCE Exam, including test organization and how the exam is scored Content review with practice questions Two practice tests Contact information for state PA licensing boards A sample online question bankKaplan Publishing Staff is the author of 'Kaplan Pance ', published 2009 under ISBN 9781419553233 and ISBN 1419553232.